This dialog appears after you select the Options button on the Select a SAT File to Import dialog. When enabled (checked) you are able to specify how the SAT (or SAB) file will be located in the target file. By using Dynamic Location, you will be able to manually rotate the SAT image and place it where and how you choose. The Use Origin feature can be used to locate the model at the origin of the original file. Finally, Set Reference Position can be used to temporarily preview the SAT in the target file. You can then cursor-select an origin on the preview and use that location to place the SAT in your drawing. The options under Entity Attributes allow you to import the attributes (line type, line width, etc) that were saved with the SAT, or use the current system attributes. 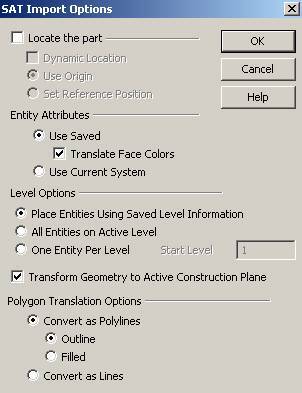 When selected (default), the imported geometry is transformed to the current active Construction Plane. Convert as Polylines – Results in triangle entities being converted as KeyCreator polylines. You can select whether these polylines are represented as outlines or filled.